A disproportionate amount of my time and energy writing here is devoted to higher end dining (leading some people to think I actually eat that way all the time!). Yes, there's a lot more glamour in a fancy tasting menu than in the average daily meal. But not necessarily more satisfaction. And as Miami rapidly becomes an increasingly expensive place to live, there's a particular joy when that satisfaction comes cheap. As we enter the season of Miami Spice, when everyone goes scrambling to sample all the $39, 3-course dinners, this year I decided to do something different. So forgive me for the click-bait title, but here are thirty great things to eat in Miami all of them under $11. A few of these come from Miami's most celebrated chefs and restaurants. Others come from places with no websites or social media managers, made by cooks whose names I will never know. Many are not terribly Instagram-friendly. What they all have in common is that they make me very happy when I eat them. Though it was not my original purpose, and though it's obviously skewed somewhat by my own personal predilections, I suspect this list might just give a more complete picture of our city than the latest restaurant "hot list" – not just the million dollar dining rooms in the South Beach and Brickell towers, but the many Latin American and Caribbean and other flavors that give Miami its – well, flavor. I'm always gratified to see exciting things happening in the Miami dining stratosphere; but there are good things closer to the ground too. Here are some of them. I wrote recently about All Day, and won't repeat myself here. Instead, I'll mention something that only occurred to me in retrospect: how comfortably it traverses the territory between new school coffee house and old school Cuban cafecito shop. Sure, the coffee beans are a lot better than the regulation-issue Bustelo or Pilon, and they don't need to put an avalanche of sugar into an espresso to make it taste good, but there's not as much space as you might think between a fancy Gibraltar and a humble cortadito. All Day even has a ventanita where you can order from the sidewalk. 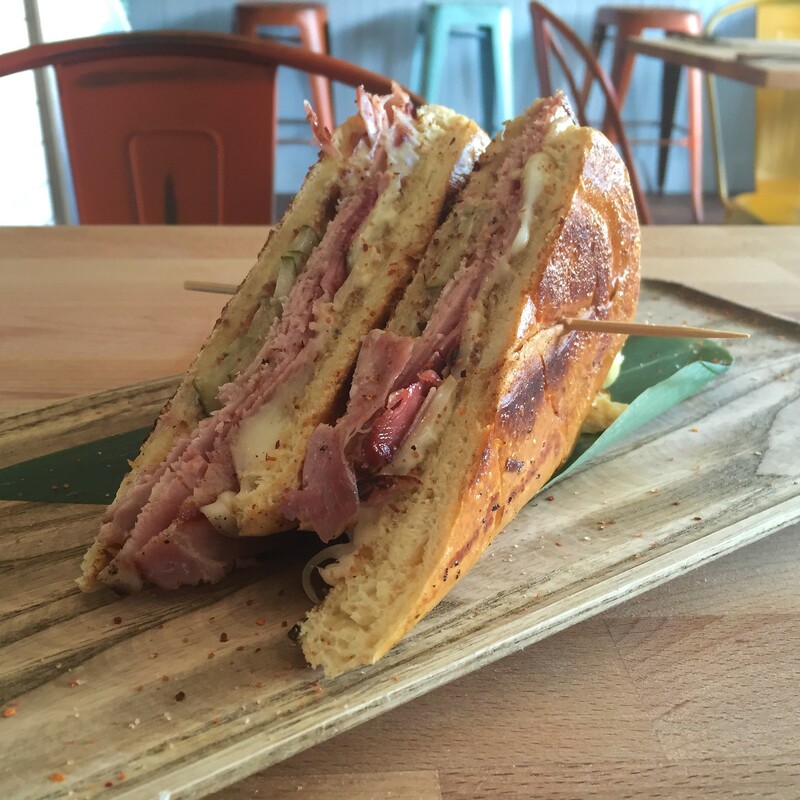 And, they've got an excellent version of a pan con croqueta, with warm, creamy ham croquetas and a runny, herb-flecked egg spread, squeezed into classic crusty pan cubano. (More pictures in this All Day - Miami flickr set). 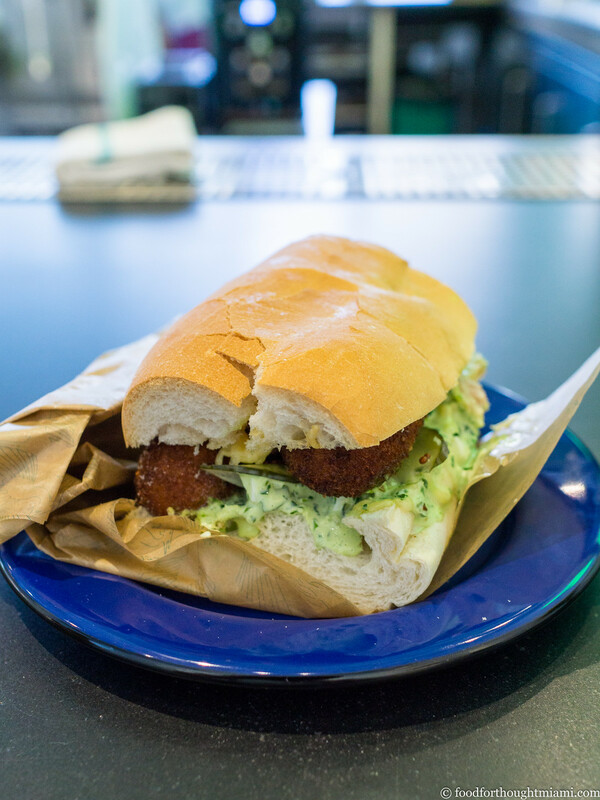 If All Day offers a new-school version of a pan con croqueta, the prototype can be found at Al's Coffee Shop, hidden away inside a Coral Gables office building. Despite the obscure location, it's usually full of police officers and municipal workers, who know where to find a good deal. 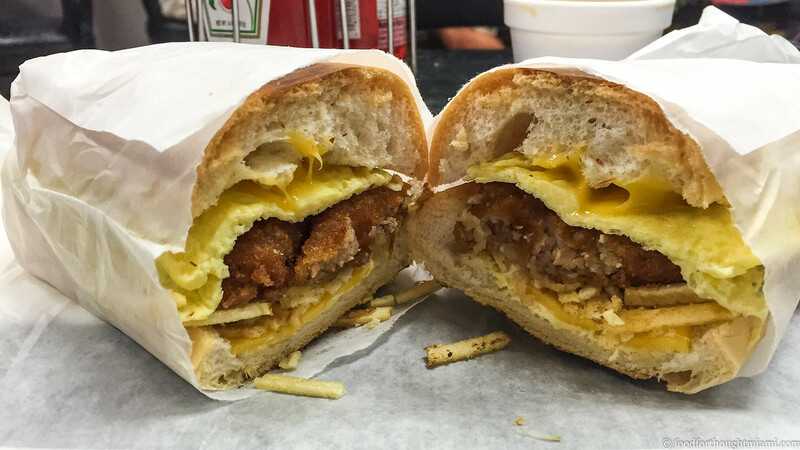 The croqueta sandwich here starts at $4.65; you can add eggs for an extra $1.25. Bonus points: on Tuesdays, those excellent croquetas are only 25¢ apiece all day. For as long as I've been in Miami – which is a long time – B&M Market has been open along a dodgy stretch of NE 79th Street. 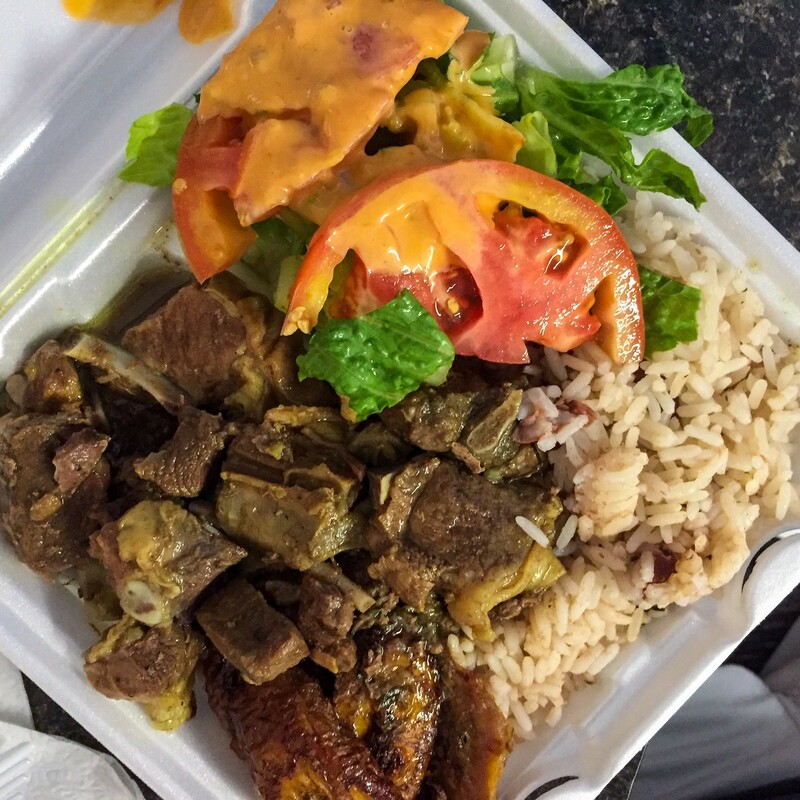 Run by a sweet, friendly Guyanese couple, this Caribbean market with a kitchen and small seating area in back turns out fresh rotis, staples like braised oxtails, jerk chicken, cow foot stew, and my favorite – the tender, deeply-flavored curry goat. A small portion, with rice and peas and a fresh salad, is plenty, and will set you back $10 – or go on Thursday when it's the daily lunch special, and it's only $7. (More pictures in this B&M Market - Miami flickr set). Wait, I thought we said $11 and under? I know, but the thing is, the "Brandon's Breakfast" – named for a fellow chef who used to cook with Blue Collar chef/owner Daniel Serfer at a prior restaurant – can easily feed two people. 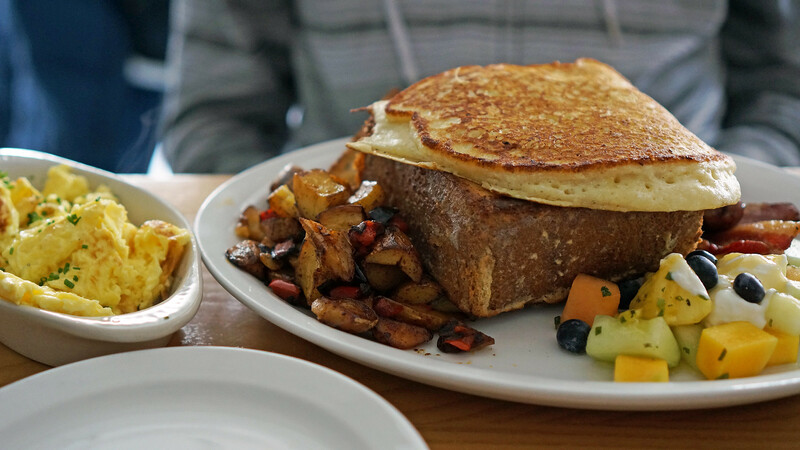 It includes a massive slab of brioche french toast, a bubbly buttermilk pancake, fluffy scrambled eggs, bacon, sausage, crisp hash browns flecked with red peppers, even some fresh fruit! This is like a Denny's Grand Slam (a Danny's Grand Slam! ), but made by someone who really cares about serving good food. (More pictures in this Blue Collar - Miami flickr set). Cake Thai Kitchen is a regular rotation place for us – I'll stop in to pick up from there just about once a week. 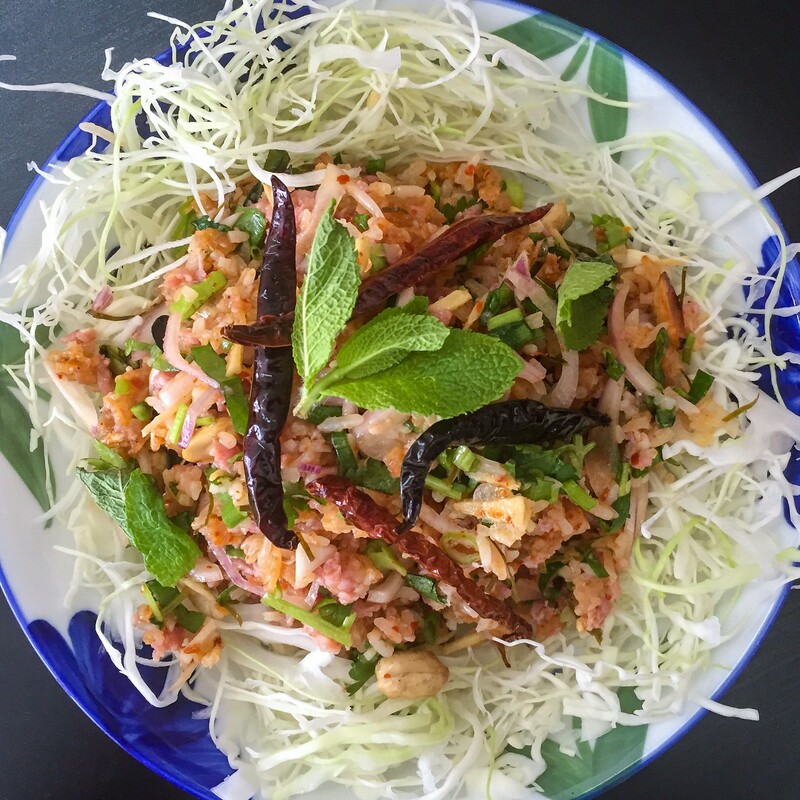 Several things from their menu of Bangkok style street foods could have wound up on this list: their properly funky and spicy papaya salad, the grilled pork shoulder and roasted rice salad, their simple but perfect garlic cabbage. I've chosen this salad of crispy rice and homemade fermented Thai "salami" because it embodies everything I love about Cake's food: the unabashed jolt of hot chiles, the tang of sour sausage, the cleansing crunch of fresh vegetables, the bright cheer of fresh herbs. I'm going to be sad when they move from their hole-in-a-wall on Biscayne Boulevard to new digs in Wynwood. (More pictures in this Cake Thai Kitchen - Miami flickr set). 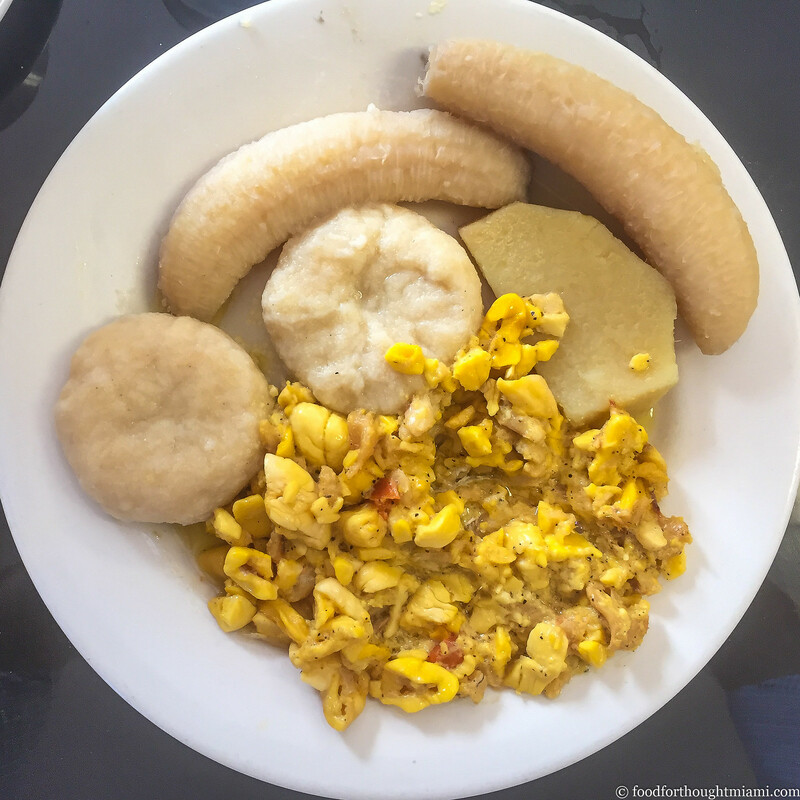 You can get a traditional Jamaican breakfast of ackee and saltfish at Clife's Cafe, now located in Little Haiti after moving north from Wynwood. The combination of creamy, starchy ackee fruit and silky, salty, rehydrated dried cod somehow makes me think of a classic breakfast from another culture: lox, eggs and onions. Rounded out with dense, chewy dumplings, a slab of yam, and starchy bananas, this breakfast may fill you up until dinner. It's still hard for me to believe that the only restaurant one of Miami's top chefs is currently running is a little breakfast-and-lunch spot tucked inside a retail space in the Design District. But if this is all I can get of Michelle Bernstein right now, I'll still take it. 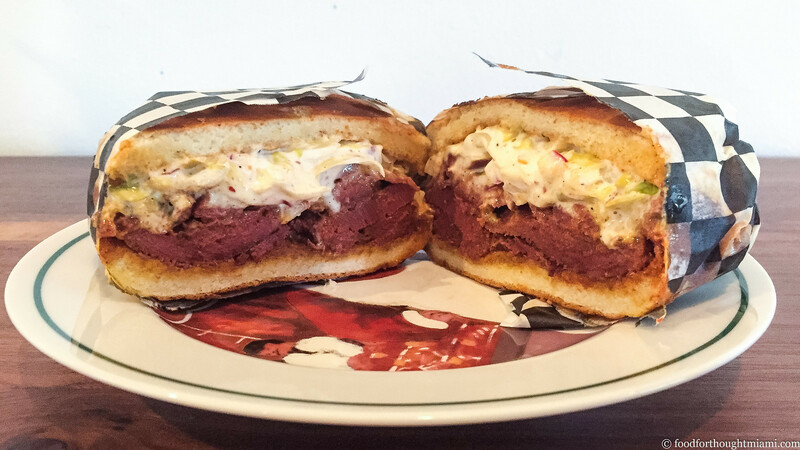 If you want to know what a breakfast sandwich created by a James Beard Award winning chef tastes like, get the Breakfastwich at Crumb on Parchment. 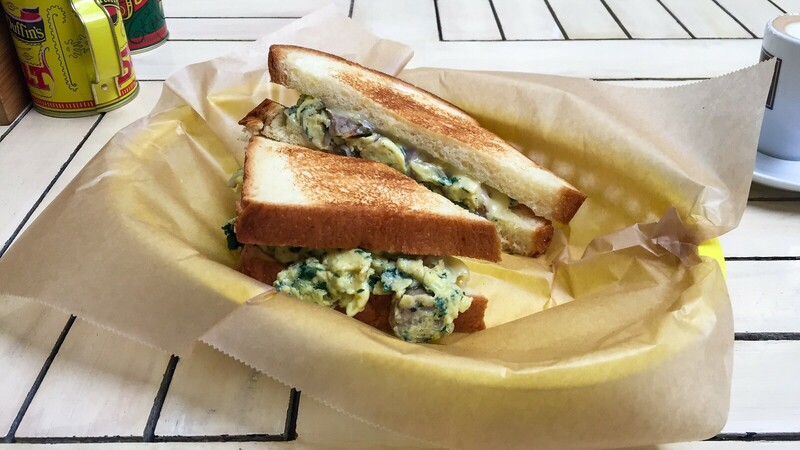 With soft, creamy eggs folded around sautéed kale, caramelized onions and savory chicken sausage, draped with melting cheddar cheese and tucked into buttery brioche, it's a pretty soigne package. Doce Provisions is another place I've written about fairly recently, which is breathing some new life into old school Cuban classics, and doing it at a very budget-friendly price point. Their El Cubano sandwich is unorthodox but excellent: smoked pork loin and soppresatta in place of the usual roast pork and ham, a softer bread than your typical pan cubano, a little mojo aioli for some extra zing. I often find little to distinguish one Cuban sandwich from another, but this one stands out. And at $8, it's a fantastic bargain too. (More pictures in this Doce Provisions - Little Havana flickr set). Doggi's is another spot that's working its way into the rotation, especially since they opened up a second location along my commute home through Biscayne Boulevard's "MiMo District." Their stuffed arepas always make for a satisfying meal, but I recently found a sleeper hit: the empanada de pabellon. 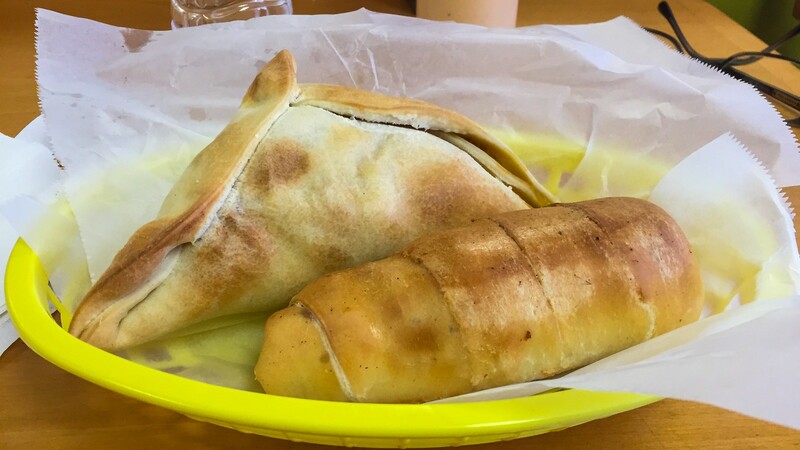 Venezuelan empanadas differ from the Argentinian versions which are more common in Miami by using a corn flour instead of wheat, and being fried rather than baked. The pabellon comes stuffed with tender shredded braised beef, sweet fried plantain, savory black beans, and soft, creamy white cheese – like a miniature meal in a $3.50 package. (More pictures in this Doggi's Arepa Bar - Miami flickr set). While the sandwich cubano gets most of the attention, there's another specialty Cuban sandwich that's worth seeking out in Miami: the frita cubana. 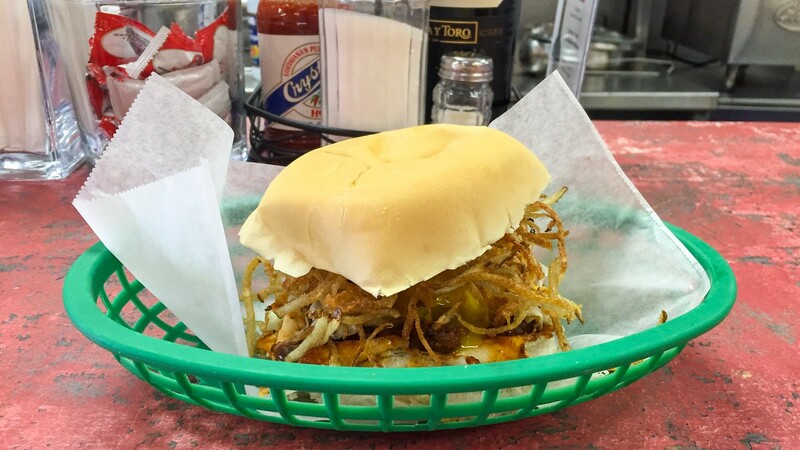 And there's no better place to get one than at El Mago de las Fritas, where El Mago himself, Ortelio Cardenas, can be found where he's been for the past 25 years – behind the counter. The paprika-spiced burger, topped with a shower of crispy potato sticks, is great as is; but if you want to splurge, get it "a caballo," with a runny fried egg, and it'll still be only $5.35. It seems like everyone is doing a crispy chicken sandwich these days. And why not? They're delicious. I've eaten several in the past year, but maybe the best comes from Chef Jeremiah Bullfrog's gastroPod. Juicy, meaty chicken thighs are marinated in gochujang, the richly flavored Korean chile and bean paste, before getting dredged and fried up crisp, then topped with housemade pickles and squeezed into a plush potato bun. 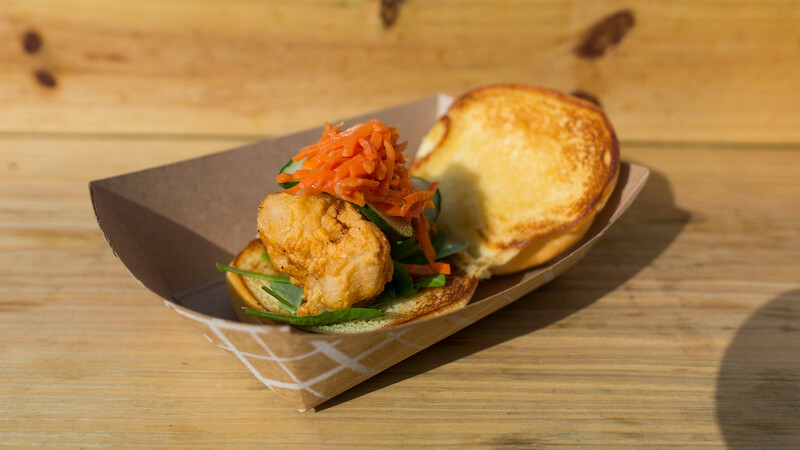 (And since the 'Pod is currently on a summer hiatus, that picture is not actually of the Crispy Chicken Sammich, but rather of the similarly constructed – and equally delicious – but not regularly available – Thee Chic Fil A, a slider with buttermilk-marinated, crisp-fried sweetbreads topped with giardiniera). 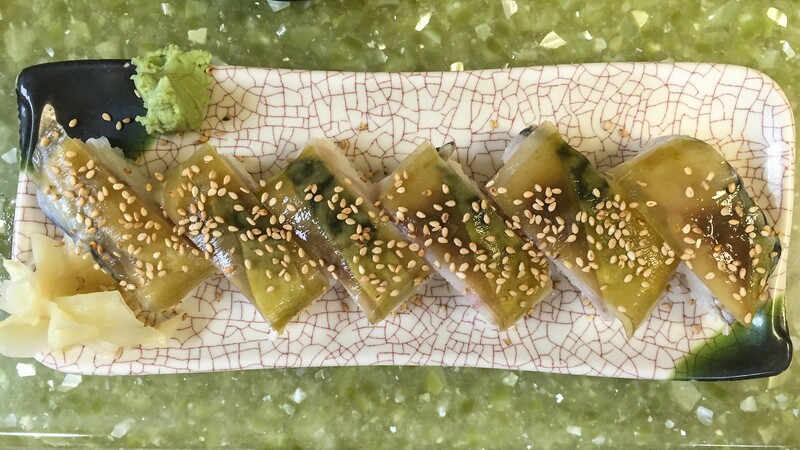 Hiro's Yakko-San, the North Miami Beach izakaya, is another place where I'm a regular, and where I could have gone in any number of different directions in picking a budget-friendly favorite. It could have been the nuta-ae, with tuna, conch, octopus and blanched greens in a mustard-miso sauce; the una tama tofu, an inexplicably delicious combination of eel and tofu cubes bound in an omelet, swimming in dashi broth; the nasu buta miso itame, a stir-fry of pork and eggplant in miso sauce; or several others items on the extensive menu. 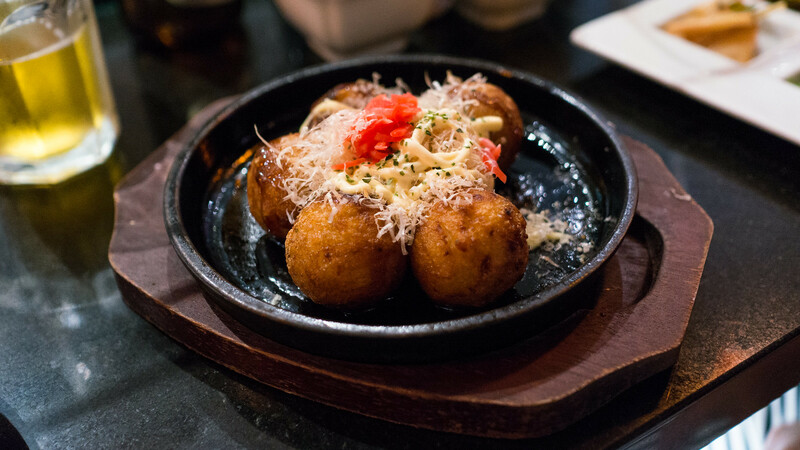 But I'm going with the takoyaki – doughy dumplings studded with chunks of octopus, topped with tangy takoyaki sauce, kewpie mayo, pickled ginger and bonito shavings wriggling in the heat. The later the evening, and the more beers you've had, the better they get. (More pictures in this Hiro's Yakko-San - North Miami Beach flickr set). How does a simple fried fish sandwich become a classic? It starts with the fish. The Garcia family has run a fish market in Miami for the past fifty years since coming here from Cuba. A decade after opening, they added some fryers and a counter, and started serving the day's catch right at the market. It's only in the past few years that they finally added some tables and chairs. I still prefer to eat at the counter, where you can watch the fresh snapper go straight from the refrigerator case to the batter to the fryer, then get tucked into a bun with some chopped raw onion and ketchup, its tail still sticking out one side. (More pictures in this La Camaronera - Miami flickr set). 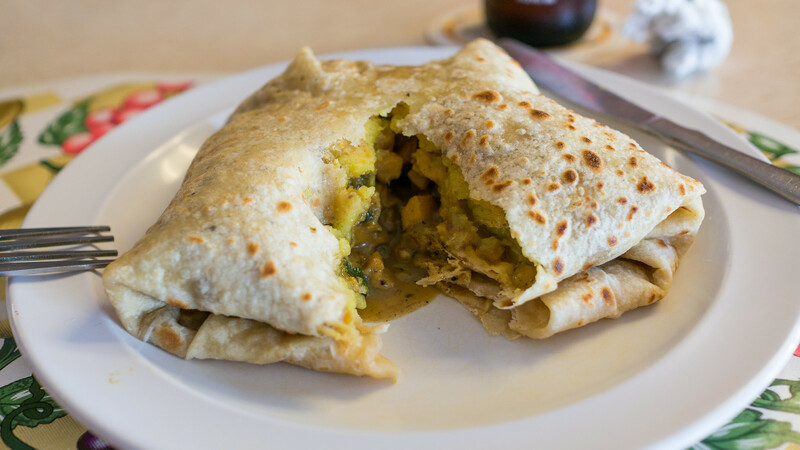 Christine's Roti Shop in North Miami Beach had been my roti go-to for a long time, but it closed a few years ago. Then I learned about LC Roti Shop from Blue Collar's Danny Serfer. This Trini spot in Miami Gardens might be even better. Yes, your neighbor at the counter might already be on his fourth beer at noon, and he may give you some grief for fork-and-knifing your roti, but it's all worth it. I get mine with conch, which is nubby and chewy but not rubbery, and does a great job of soaking in all that spice and sauce, all barely held together by the thin, chewy, made-to-order flatbread. Other options include duck and goat, plus buss up shut and doubles. (More pictures in this LC Roti Shop flickr set). There are many themes which seem to be common across culinary cultures: just about every cuisine has some form of a dumpling, and most have their supposed aphrodisiacs, equaled perhaps only by their supposed hangover cures. In Peru, the hangover cure of choice is Vuelve a la Vida, which translates to "return to life." 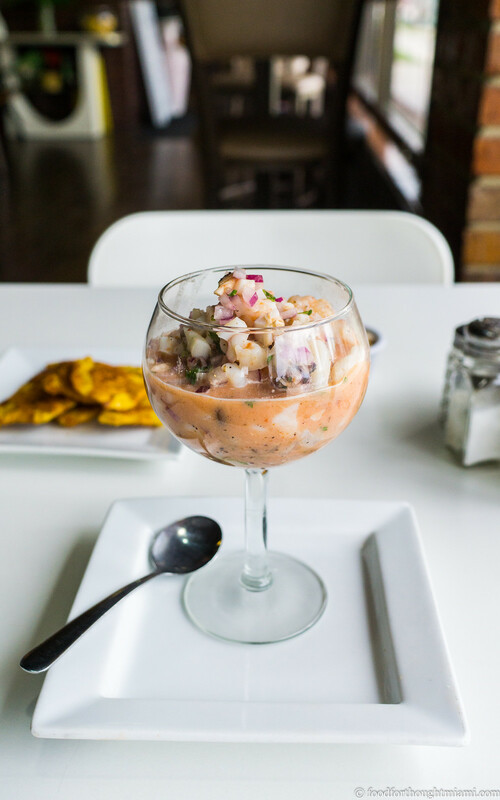 This ceviche variation uses an assortment of finely chopped seafood – here, shrimp, octopus, mussels, scallops – all swimming in an intensely citrusy marinade spiked with as much aji rocoto heat as you like (you're going to want this spicy). There are plenty of places you can get this in Miami, but I'm partial to Limon y Sabor on Biscayne Boulevard. 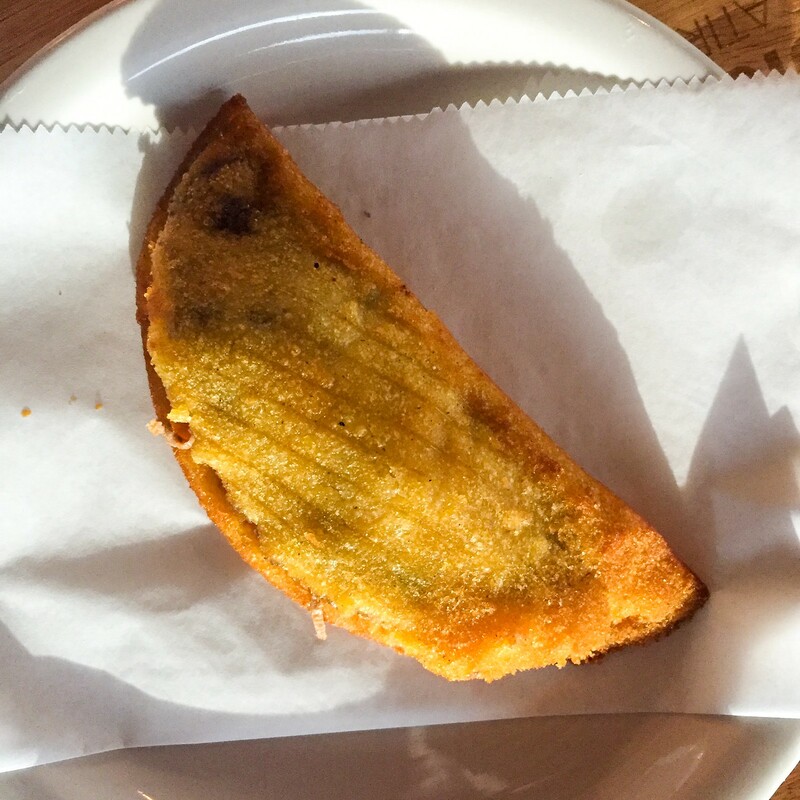 Pro tip: order some tostones and ladle some of your vuelve a la vida onto your crisp, salty fried plantains. Michael Pirolo may just make the best pasta in Miami. Before opening Macchialina, he honed his pasta-rolling skills at Scarpetta, where the spaghetti with tomato and basil is famous for selling at $24 – and being worth it. 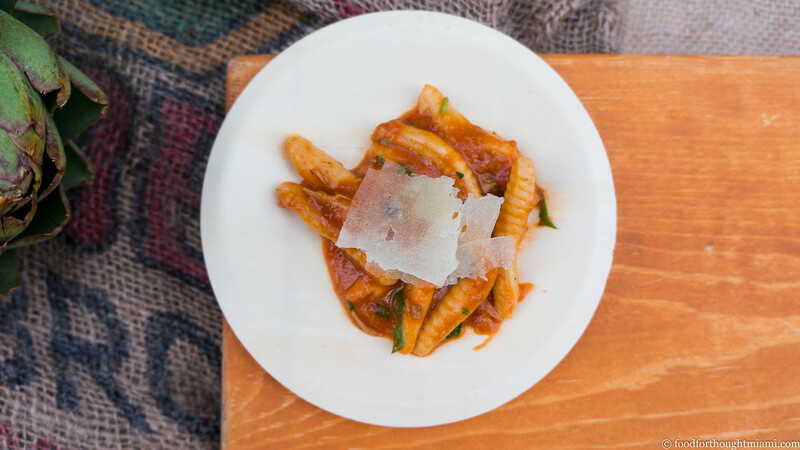 So when Pirolo serves up his pasta for $10 a plate – well, go get it. It happens every Thursday at Macchialina, with a rotating selection every week. (More pictures in this Macchialina flickr set). Speaking of hangover cures ... judging by the number of appearances that tripe makes among them (menudo, mondongo, khashi, iskembi corbasi), you'd suspect the hand of the Tripe Marketing Board at work. 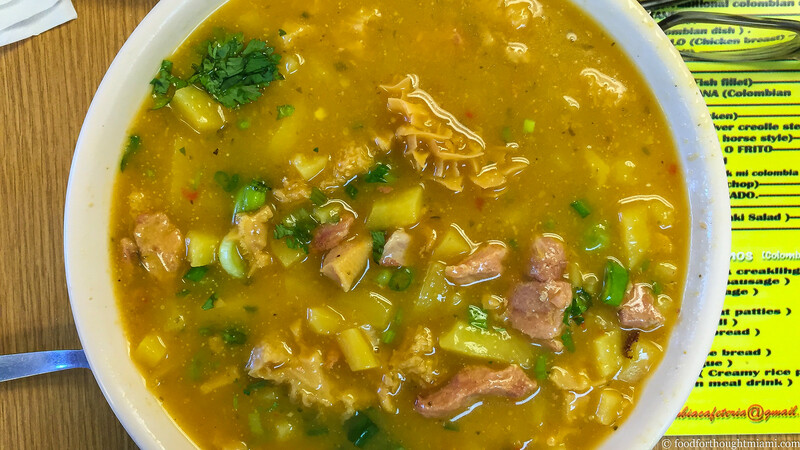 Even if I haven't been drinking the night before, I still enjoy a hearty bowl of the sopa de mondongo at Mi Colombia, served on Tuesdays and Saturdays at this counter-only spot in North Beach on 71st Street. It's stocked with ribbons of soft tripe, nubs of chewy pork, chunks of a few different kinds of tubers, all awash in a rich, almost sticky broth, and topped with a bouquet of fresh cilantro. Squirt some of the home-made hot sauce to brighten it up; scoop some white rice to fill it out. You'll start feeling good no matter what you did last night. From a small storefront along Collins Avenue in North Beach, little Moises Bakery manages to turn out baked goods representing three different countries. There are empanadas in the styles of Argentina, Venezuela, and Chile, plus an assortment of sandwiches and other items. 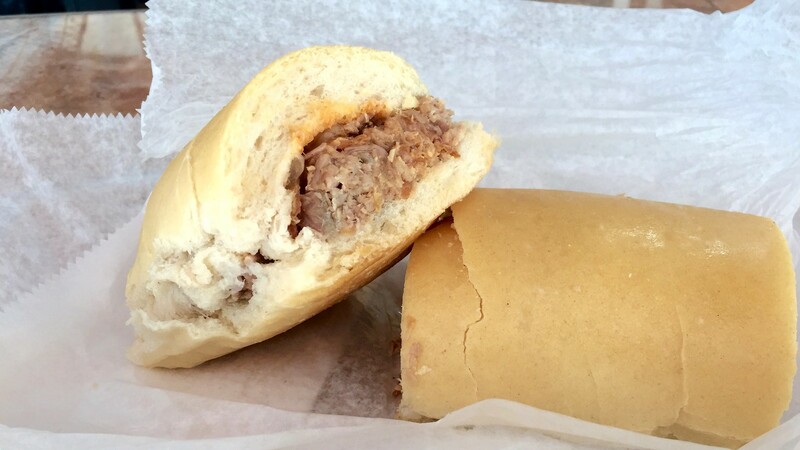 My favorite is the cachito: a roll about the size of a croissant, but with a sturdy, chewy dough wrapped around a filling of warm diced ham and gooey cheese. Sam Gorenstein had some pretty good chef gigs: a run at Michael's Genuine, followed by the chef de cuisine job at BLT Steak. So I found it a little surprising when he walked away from it all to open a tiny ceviche shop on the southern end of South Beach. Shows what I know. He partnered with Roger Duarte, who was already running a seafood distributor, and they now have a half dozen thriving locations. The ceviches are good, but my favorite thing on the menu is their grilled octopus burrito, the chopped octopus tender but with nicely charred edges, the burrito bulked up with rice or quinoa, and filled out with tart pickled red onions, fresh cherry tomatoes, sweet corn and queso fresco. 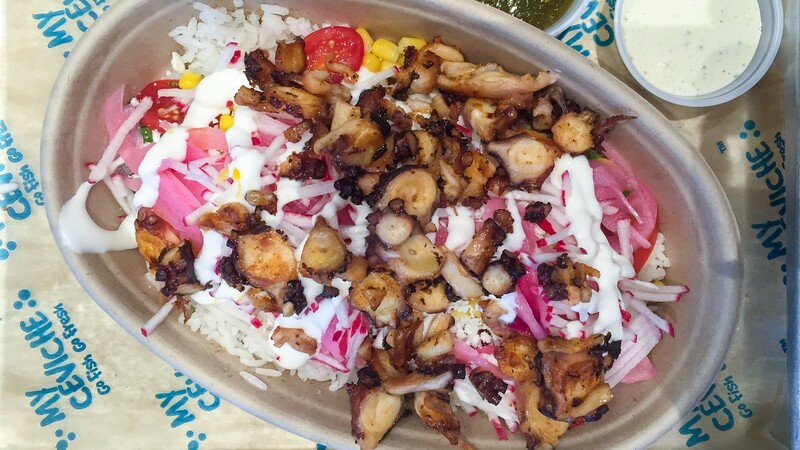 (And yes, that picture is not actually of a burrito, but of their Burrito Bowl, which has all the same stuff, minus the tortilla. I've decided there is simply no way to take a remotely attractive picture of a burrito). Noor Bakery, a Lebanese bakery in Fort Lauderdale just west of I-95, is worth making the trek across the border into Broward County. Their puffy, freshly baked flatbreads come with a variety of toppings. My favorite may be the one topped with egg, stretchy white cheese, and sujuk, a spicy Middle Eastern beef sausage. But when they're less than $3 each, why get just one? 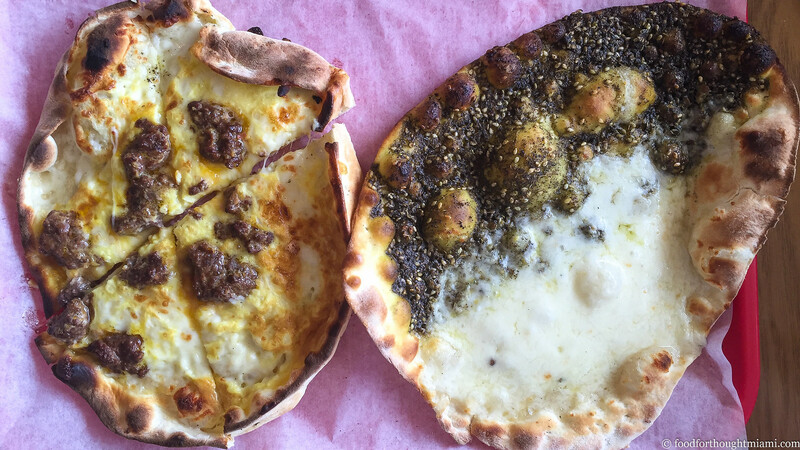 Try one topped with bubbly cheese and a generous blanket of za'atar spice, too. Do one thing, and do it really well. It's not an ethos followed much in Miami, where too many places try to be everything to everyone. At Papo Llega y Pon, in rough-and-tumble Allapattah, they do pretty much one thing. Pan con lechon. And they do it really well. They roast the pig, swabbed with mojo and then chopped to order; the key is a good mix of crispy skin interspersed with the cottony tender meat. They bake the bread in house. Put them together and you have a thing of beauty. Your only choices are the size (anywhere from a small, about 6 inches, to a full loaf), and whether you want onions (yes) and salsa picante (yes). Anything else would be extraneous. (More pictures in this Papo Llega y Pon flickr set). I'm not one to get excited over a grilled chicken breast sandwich. 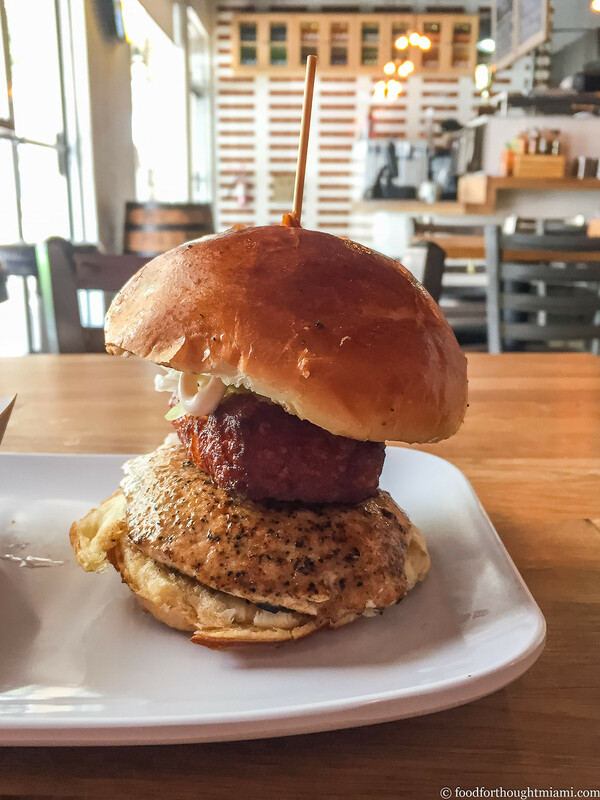 So there must be something special about the Fritanga Chicken Sandwich at Pincho Factory. It starts with the chicken itself, which is nicely browned but still nice and juicy (I'm guessing a marinade which is also used to baste as it grills), and actually has some real chicken flavor instead of just serving as a blank canvas. A block of fried white cheese keeps it from feeling too spartan. A crisp cabbage slaw adds some freshness, a squirt of crema pulls it all together. This is probably the only place where I'll happily take the grilled chicken over the burger, rather than feel like I've made a big sacrifice. Really great food cities are usually distinguished by attention to quality all along the food chain: not just great restaurants, but great bakeries, butchers, fishmongers, and markets. Miami's not really there yet, but Proper Sausages in Miami Shores is doing its part. They not only make outstanding sausages, but they also procure and butcher high quality, thoughtfully sourced meats, and have more recently added a small lineup of prepared lunch items. It's not on the menu all the time, but when it is, their BBQ tongue sandwich is my favorite: the thick-cut but tender off-cut loaded with beefy flavor, slathered in a tangy BBQ sauce, dripping with creamy coleslaw, and barely contained by a soft but sturdy Portuguese muffin. (More pictures in this Proper Sausages - Miami Shores flickr set). Poke may be the avocado toast of 2016, but there's been one on the menu at Pubbelly Sushi for years (at least since 2012). 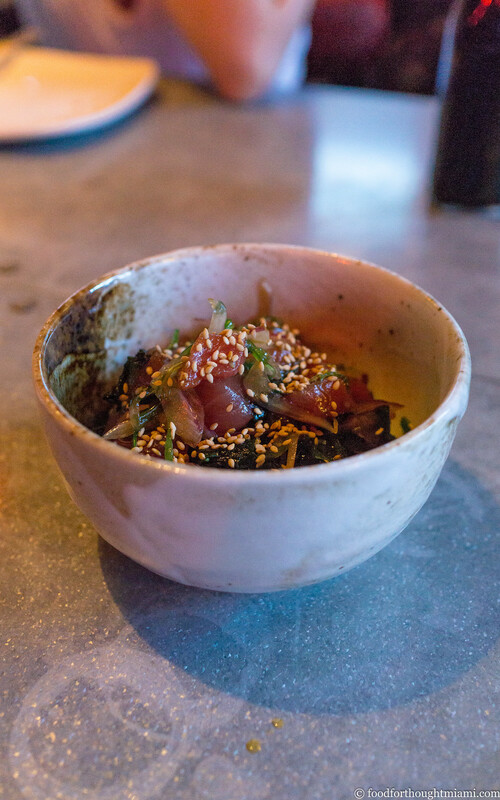 It's a really good one too: big cubes of fresh ahi tuna, sharp slivered red onions, a variety of different seaweeds, dressed lightly with soy and sesame oil, topped with toasted sesame seeds. It's pure and simple and reminds me of some of the best versions we had in Hawaii a few years ago. (More pictures in this Pubbelly Sushi flickr set). Look. I like tots as much as the next guy. Maybe even more. And when you combine them with melty cheese, chopped kalbi beef, a generous slathering of spicy ssamjang sauce, and a shower of green onions, well, that's really tough to resist. 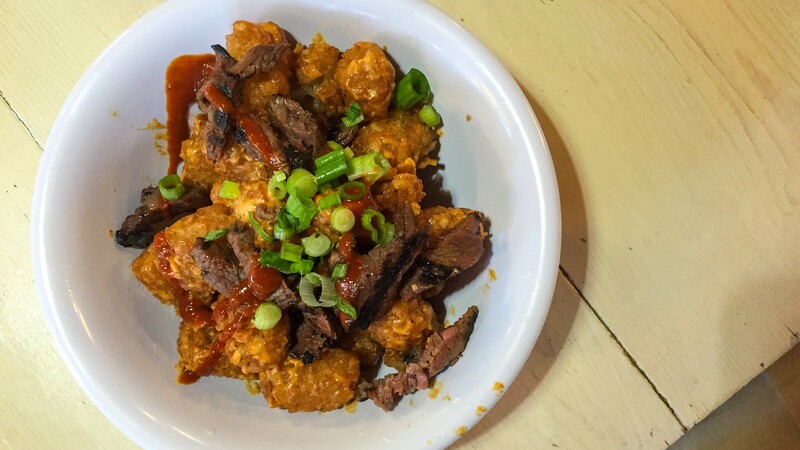 It's a toss-up between this and the crackling duck sandwich as my favorite item on the Sakaya Kitchen menu, but the Chunk'd Spicy Cheesy Kalbi Tater Tots might just get the edge because they make me imagine an alternate universe where there are Waffle Houses in Korea. For reasons I have never fully understood, Su Shin Izakaya lists this dish in the sushi rolls section of its menu, with the mysterious disclaimer "(not a roll, let us surprise you!)". Of course, a long time ago, I did exactly that, and was very pleasantly surprised indeed. (Spoiler Alert!) 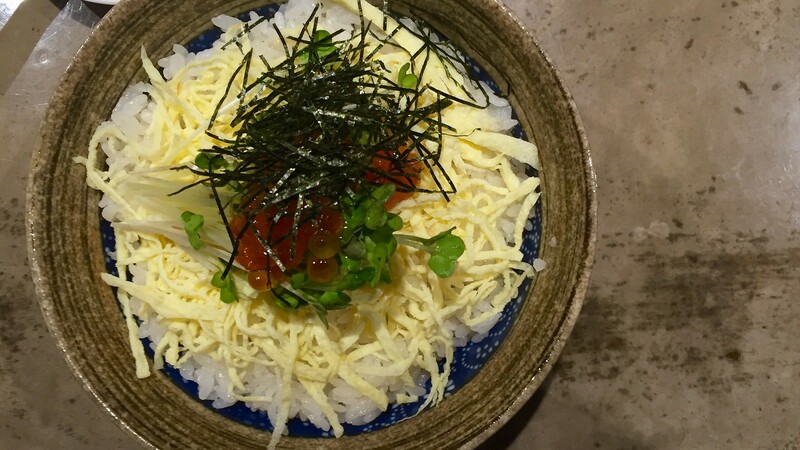 It is in fact not a roll, but rather a rice bowl, topped with grilled salmon, diced avocado, julienned tamago (omelet), sprightly kaiware (daikon sprouts), slivered strands of nori, and a generous dollop of ikura (salmon roe). Unless I'm traveling, I probably have eaten this once a week for the past ten years. No doubt that has something to do with the fact that Su Shin is two blocks from my office, but it's also because this is, to me, a just about perfect lunch. There are many rules at Sushi Deli, but the first rule of Sushi Deli is "You do not talk about Sushi Deli." Yet so many people have broken the rule – Michelle Bernstein, José Andrés, me – that it seems pointless to try to keep it secret any more. I won't say much; just that the Osaka-style battera roll, the rice pressed in a box and topped with silver-skinned, vinegar-cured mackerel, pickled seaweed, and toasted sesame seeds, is one of my favorite things to eat anywhere. (More pictures in this Sushi Deli / Japanese Market flickr set). By many people's calculus, $3.50 is actually a pretty pricey taco. 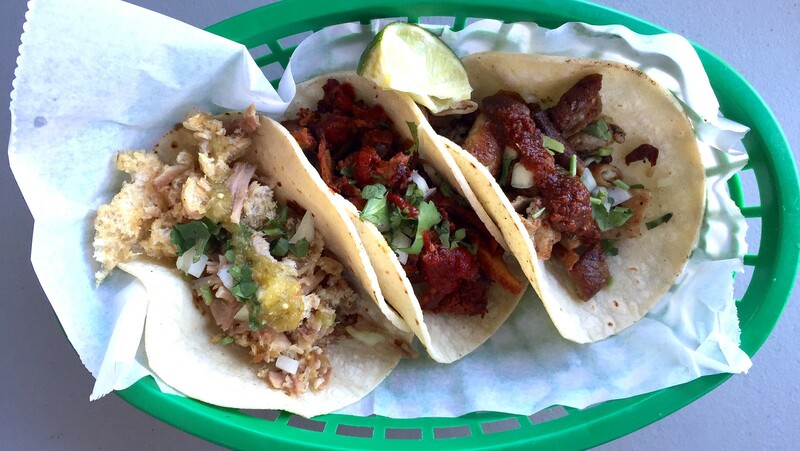 And when you're accustomed to $2 tacos, I get it (and if you want a great $2 taco, look immediately below). But that extra $1.50 is money well spent at Taquiza, where they nixtamalize and grind their own landrace corn, then press it into the best tortillas you'll find in Miami. 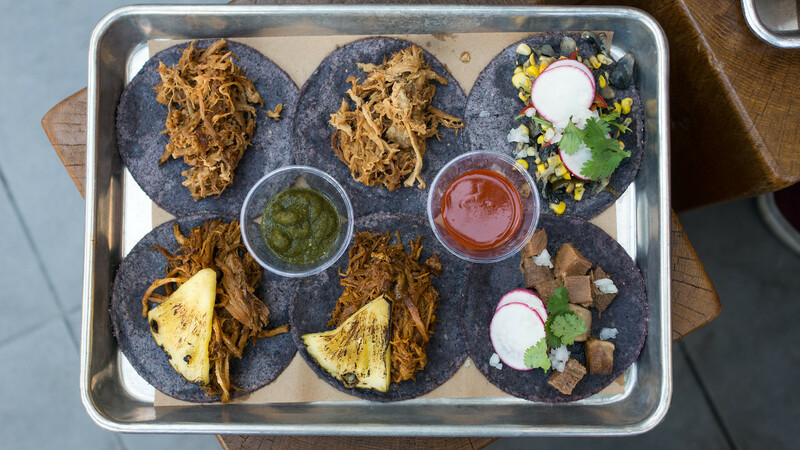 Toppings are simple, like the soft, beer-braised lengua, or the al pastor pork dyed orange with achiote and served with a slab of grilled pineapple. Even at $3.50 a pop, you can still get three tacos for under $11 and call it a meal, and that still counts as a bargain to me. Also, don't miss the puffy totopos ($5), puffed blue corn masa chips ideal for scooping creamy guacamole. (More pictures in this Taquiza - Miami Beach flickr set). Sure, the tortillas are better at Taquiza. But if you can't bring yourself to pay $3.50 a piece, you can still get a great $2 taco at Viva Mexico, an open-air space on 12th Avenue in Little Havana. I'd be hard-pressed to pick a favorite. The campechano, with chopped pork leg mixed with crispy chicharrones? Or maybe the chewy tripas, with just enough barnyard funk to remind you what it is? The good news is that at this price, you can try several. (More pictures in this Viva Mexico flickr set). No doubt there are a lot more than thirty that I've missed. Let me know what's on your list. With one venture across the Dade-Broward line. I had initially wanted to make the threshold $10, but too many of my favorites wouldn't have made the cut. Culinarily, Japanese in particular is probably over-represented; and geographically, this is probably skewed towards where I work (Coral Gables) and live (North Beach). No doubt there are huge swaths of Miami, especially in the south and the west, which I don't know nearly as well. There also seems to be a high number of breakfast sandwiches, even though I actually don't eat breakfast all that often. 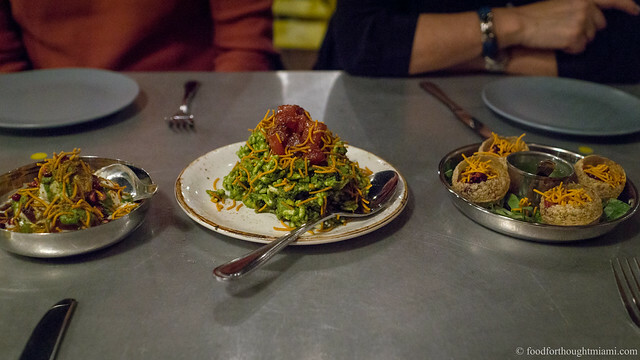 What does it say that Jewish food seems to have neither aphrodisiacs nor hangover cures? Apparently, there are those who claim that matzo ball soup is both aphrodisiac and hangover cure. Sure. Sometime before my most recent visit, they replaced the countertop that separates the open-air kitchen from the parking lot. I was sad to see that the hand-written ruler markings showing the different sizes are now gone. Right as I was about to press "Publish," I discovered that the price of the Porque Mt. Fuji has increased to $11.50. But I simply can't leave it off this list. Go try it and I'll spot you the 55¢. There were stories published a few months ago that Viva Mexico was closing, but my last visit was right after those stories went up, and there are still new Yelp reviews going up as recently as this week, so rumors of its demise appear to be greatly exaggerated. Thanks 2Top, going to have to check that out! Have enjoyed your writing for a long time. Realized I have never commented. Keep up the great work! Live in North Beach and love that you highlight some of the usually overlooked places in our neighborhood. 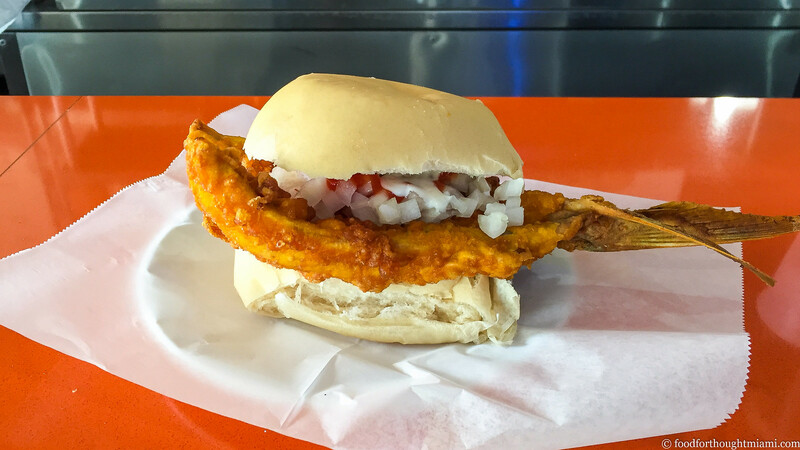 The pan con minuta from La Camaronera definitely gets my vote for quality and value. I'm a fishing boat captain so I know a thing or two about fresh fish. Nice! I'm looking forward to checking out the ones I have not tried. Thanks for taking the time to put this review's/list together, I use them all the time. I so do miss that takoyaki. We haven't had it in so long, and when I saw it on a sushi menu here in Baton Rouge we ordered it and were so disappointed. I'm not sure what we were served, but it was a far cry from the Yakko-San excellence we were once used to. I think of Yakko-San often, and I guarontee! the next time I land in Miami I'm making a bee line for that spot! I can still taste the monkfish liver and ponzu and chicken livers with sprouts and chive blossoms (speaking of, is that under $11 cause it's the stuff dreams are made of). Miss you, Frod!